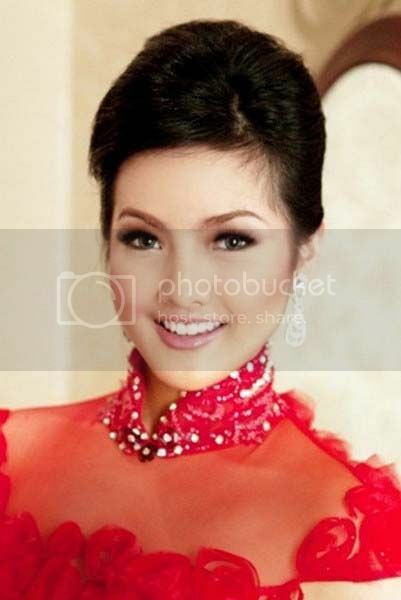 Notes: Astrid Ellena is the reigning Miss Indonesia World 2011. As a student, Astrid hopes to achieve her dream of becoming an Indonesian diplomat. She is keen to introduce aspects of her Indonesian culture to other parts of the world. Hobbies: swimming, reading and playing the piano. Indonesia is a country rich with culture and tradition. It is home to over 238 million people making it the world’s fourth most populated country. I would like to be a diplomat and show the Indonesian culture to the world. I’m a determined person. I don’t give up easily when trying to achieve my goals. Never say “God I have a big problem”, instead say, “Problem I have a big God”. Yes, I have a Yorkshire Terrier. My most memorable moment was my first day of school in America as I had dreamed of going to school in a foreign country as I had travelled and enjoyed seeing different cultures.